Vehicles that come from the Porsche factory are usually subject to a lot of attention from the tuning world. The Panamera Turbo is no different. A number of companies offer extensive kits for the four-door luxury saloon. This should come as no surprise though, after all, the Panamera is – together with the 2nd-generation Cayenne – Porsche’s best-selling model. 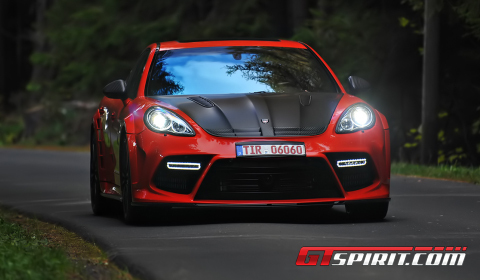 With the facelift around the corner we headed over to Mansory to test out their variation on Porsche’s grand tourer. The Panamera Turbo combines performance, space and luxury with refinement and excellent performance. 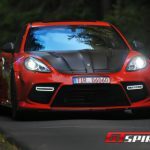 For us it is not the first time we driving a tuned Panamera Turbo, and with numerous versions already released by a wide variety of tuners it is definitely not the last Panamera we will take for a road test. 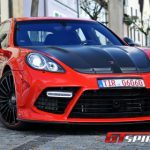 Mansory Switzerland’s package for the Porsche Panamera Turbo is packed with modifications. The company specialises in fine-tuning Porsche vehicles and they didn’t disappoint. The Zuffenhausen GranTurismo gets a hot-blooded power pack with 690hp, maximum torque of 800Nm and a completely new body design following the lines of Porsche’s initial design. Some may call the fourth model in the Porsche family ugly, or even an abomination. Mansory hopes to convert these critics with their unique design. 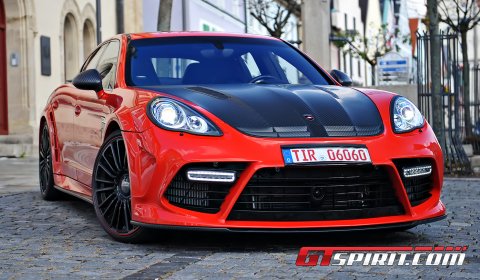 The most noticeable part of the Mansory Panamera modifications is the design of the vehicle. The approach of the Panamera program is quite similar to other programs available from the Swiss tuner. The aggressive body kit, striking interior refinements and distinctive exterior color trim create a one-of-a-kind setup. You either love it or you hate it. 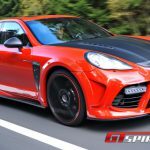 Mansory fit the Panamera with an aggressive new front skirt with adaptive LED daytime running lights and a bonnet manufactured from carbon fiber. Masculine wheel-arches that extend to the wings and doors are accompanied by a new set of side skirts. At the back of our red four-door test car, an enormous carbon fiber diffuser and centrally located sports exhaust system with double end pipes make the vehicle difficult to miss. Mansory can either add to the originally hydraulic rear wing with carbon applications or entirely replace it with a static rear wing made of carbon fiber, which blocks your rear view completely. The red-coloured body work and carbon fiber exterior trim is complemented by a set of 22 inch turbine design forged wheels. At the front axle, the nine-inch wide wheels carry high performance Dunlop SP SportMaxx tires in the dimension 265/30ZR22 while the rear ten-inch wide wheels are equipped with tires measuring 295/25ZR22. We found that the larger rims do affect the comfort levels, especially when you engage the sport mode. The ride is slightly harder and pot holes are felt inside the cabin. Changing back to comfort cures most of the unpleasantness. 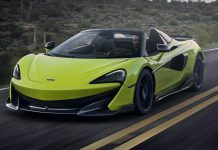 Under the hood is the familiar 4.8 liter V8 engine with twin turbochargers providing a stock 500hp at 6,000rpm and 700Nm of maximum torque between 2,250 and 4,500rpm. The power pack offered by Mansory contains adjusted engine electronics, larger turbochargers and a stainless steel sports exhaust system. Several parts inside the engine compartment have been replaced by carbon fiber equivalents. Thanks to these modifications, the engine output rises to 690hp and the torque to 800Nm at 4,800rpm. As a result, the 4WD-super saloon accelerates from 0 to 100km/h in just under four seconds and achieves a top speed of 328km/h. Overall, the power kit provides a substantial increase in power across the complete rev-range. At higher speeds the additional amount of horsepower comes into play pushing the vehicle beyond the 300km/h mark. The speed potential of the Panamera Turbo makes it a wonderful grand tourer, even at higher speeds on the Autobahn. 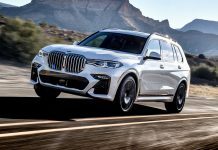 The Turbo’s performance is due, in part, to its use of the excellent ZF-sourced seven-speed PDK dual-clutch automatic, which consists of two ‘half gearboxes’ and two clutches. Smooth shifts between gears are completed in a matter of milliseconds. You can manually control the gear changes through steering-wheel-mounted switches. While other tuners swap the switches for paddle shifters, Mansory played by Porsche’s book and kept the idiotic buttons on the steering wheel. On the inside, you will find four identical, deeply contoured buckets divided by a high transmission tunnel running the length of the passenger space. The seating position behind the steering wheel is around the same height as the 911. Mansory offers a freshly installed leather interior combined with pedals made from brushed aluminium and a newly designed sports steering wheel. Our limited edition test car was fitted with a red/black leather interior, Mansory Switzerland’s signature floor mats and an interior package with red/black mesh pattern trim components. The kit includes a dashboard trim strip, door panels, center console, and rear center console trim. Finishing our story about Mansory’s and their take on the Panamera Turbo brings us back to the moment we handed the keys back to the owner, Kourosh Mansory. Once again, the 4.9m long, 1.9m wide, 1,970kg Grand Tourer left us speechless after an afternoon inside the remarkable high-end luxury sedan. The Panamera Turbo is incredible fast, brilliant to drive for a two-ton four-door car, and offers surprising levels of comfort and luxury. 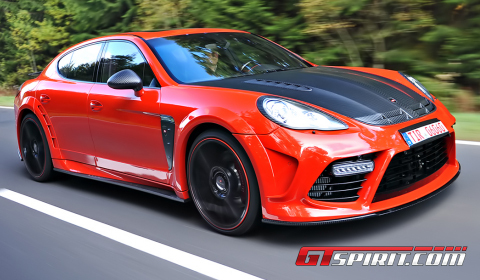 Mansory left its mark with this limited edition Panamera Turbo. The tuner from Switzerland has showcased us what it’s capable off and it is more than just a fancy colour and a flashy interior. On a technical level they offer a unique package with a series of well-thought out upgrades for an already outstanding Grand Tourer. Mansory can offer you the full deal; it is up to you if you go for it.